To grow a successful business and stay competitive, an affordable, scalable platform is critical to streamline business processes and improve decision-making. SAP Business One is designed and priced for growing businesses and integrates core business functions across your entire company from financials and accounting to inventory and production. 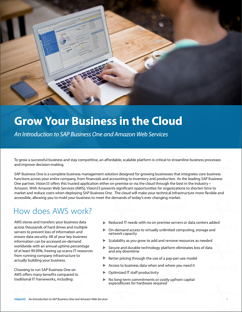 As the #1 provider of SAP Business One worldwide, Vision33 offers this proven solution either on premise or in the cloud powered by Amazon Web Services (AWS). Vision33 presents significant opportunities for organizations to shorten time to market and reduce costs when deploying SAP Business One. The cloud offers more flexibility and accessibility, allowing you to mold your business to meet the demands of today’s ever-changing market. To find out more about SAP Business One Cloud, access our Introduction to SAP Business One Cloud Guide by completing the form.